This Near Northwest neighborhood holds onto its Puerto Rican roots with pastries, pork and potent cortadito coffee. It’s hard to miss the enormous Puerto Rican flags that sandwich the stretch of Division Street between Western and California Avenues and signal that you’ve entered “Paseo Boricua.” The sprawling park that gives the neighborhood its name remains the area’s anchor, and while gentrification is adding diversity, even as camera crews film the big-budget Humboldt Park, the neighborhood is still the one Puerto Ricans have called their home away from home since the 1970s. Though the area proudly touts its island heritage, start your journey with Mexican fare and a nourishing bowl of pozole (pork and hominy soup) at the Aguilar family’s 1 Restaurant y Pozolería San Juan (1523 N Pulaski Rd, 773-276-5825). There are three versions: regular, green (spicy) and red (hot); on weekends the restaurant is open 24 hours for revelers seeking out the soup’s restorative powers. Then head east on North Avenue to get your first taste of Caribbean Creole at 2 Sabor Latino (3810 W North Ave, 773-227-5254). Even if you’ve missed them at Taste of Chicago, the Sierra family will happily fix you up a plate brimming with traditional Puerto Rican specialties like cuchifrito, fried pork or lechón (seasoned roast pork). They bake their own pan criollo (a slightly sweet, soft baguette-style loaf) and make desserts like flan fresh daily. 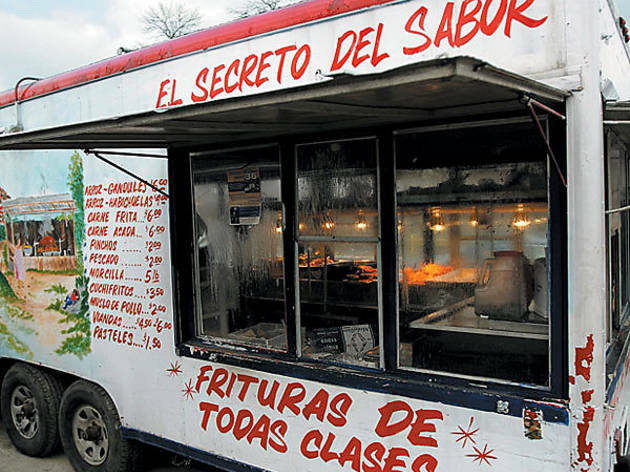 (The Sierras also run two of the trailers in Humboldt Park where you can buy papas rellenas (meat-filled, deep-fried mashed potato balls) or the crispy cod fritters known as bacalaitos. 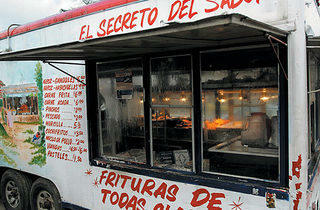 The trailer marked 3 El Secreto Del Sabor is on Division Street just east of Kedzie, while 4 La Esquina Del Sabor lies off Humboldt Boulevard and Luis Munoz Marin Boulevard.) For more spicy goodness, walk east to 5 Taquería Puebla (3619 W North Ave, 773-772-8435). Try unique offerings from the province of Puebla, like tacos arabes (spicy pork), cemitas (sandwiches) and the spicy jalapeño-corn drink chileatole. Soda fans should try the Coke, which is imported from Mexico, where they still use cane sugar in the recipe. For more sugar, head down the street to 6 San Juan Bakery (3335 W North Ave, 773-395-0099). Have a seat at the counter and recharge with a cup of coffee and a quesito (flaky, cream cheese–filled pastry). Just across the street, the Dominicans represent at 7 Tropical Taste (3330 W North Ave, 773-395-0804), where you’ll find Chinese food alongside Dominican specialties like marinated roast chicken, carne guisada (stewed beef), rabo encendido (spicy oxtail) and mangú (green plantains mashed with butter and fried onions). Go there enough and owners Sobeida and Esmeraldo Cruz will probably remember your regular order. Make a quick stop at Humboldt Park institution 8 Roeser’s Bakery (3216 W North Ave, 773-489-6900), which has provided the neighborhood with enough cookies, cakes and donuts to satisfy the most colossal sweet tooth for the past 97 years. From Roeser’s, keep walking east to California, take a left and find yourself at the home of the jibarito. The best-seller at 9 Borinquen Restaurant (1720 N California Ave, 773-227-6038), the jibarito is a sandwich made with your choice of beef, pork or chicken, with lettuce, mayo and cheese between fried plantains instead of bread. Next, head south to the heart of the neighborhood on Division Street. Start at 10 Latin American Restaurant (2743 W Division St, 773-235-7290). Since 1958, this family-owned place has offered appetizers like alcapurrias (balls of green banana dough filled with seasoned pork and deep fried) and piononos (sweet plantain strips rolled with seasoned ground beef that are, yes, again, deep fried). Play pool to the sounds of salsa and reggaeton, and order drinks from the bar stocked with everything you need to channel the island vibe. From there, head east to 11 La Bruquena (2726 W Division St, 773-276-2915). Owners Zoraida and Robert Tañón run the place with the help of a devoted staff (the cook has worked there for 36 years). They consistently turn out fresh Puerto Rican homestyle cooking and have created a familiar environment for those nostalgic for the island. A few feet down the block you’ll hit 12 Coco (2723 W Division St, 773-384-4811), a fairly swanky spot that puts a modern twist on Puerto Rican cuisine and offers martinis like the sweetish Malta spiked with coffee liqueur. Further east, fuel up with a cortadito (espresso with cream and lots of sugar) at 13 Café Colao (2638 W Division St, 773-276-1780). Make like the old men who play dominoes out front and chat, sip espresso and munch on freshly baked pastries, including an unparalleled guava cream cheese Danish. Up next is the block’s newest eatery, 14 La Plena (2617 W Division St, 773-276-5795), a good Friday-night option for beef soup with plantain and pigeon peas to the sounds of salsa and merengue courtesy of area DJs. Further down the street, at 15 Papa’s Cache Sabroso (2517 W Division St, 773-862-8313), Victor and Nancy Garcia’s roast chicken is a must. Eat in or buy a whole or half bird to take with you, and don’t forget the arroz con gandules (rice with pigeon peas). Finally, there’s Café Colao’s sister restaurant 16 Nellie’s (2458 W Division St, 773-252-5520), which boasts a lunch buffet on weekdays and—for those who prefer to spend their Sundays leisurely hitting up a buffet while reading the paper—a brunch buffet on the weekends.